NOW: The Ridgemont still shows a marquee, but it names a condominium not a screen. The hundreds of seats were removed and the theater razed. A few weeks ago we featured the Green Lake Theater, photographed by Lennard LaVanway in 1947. 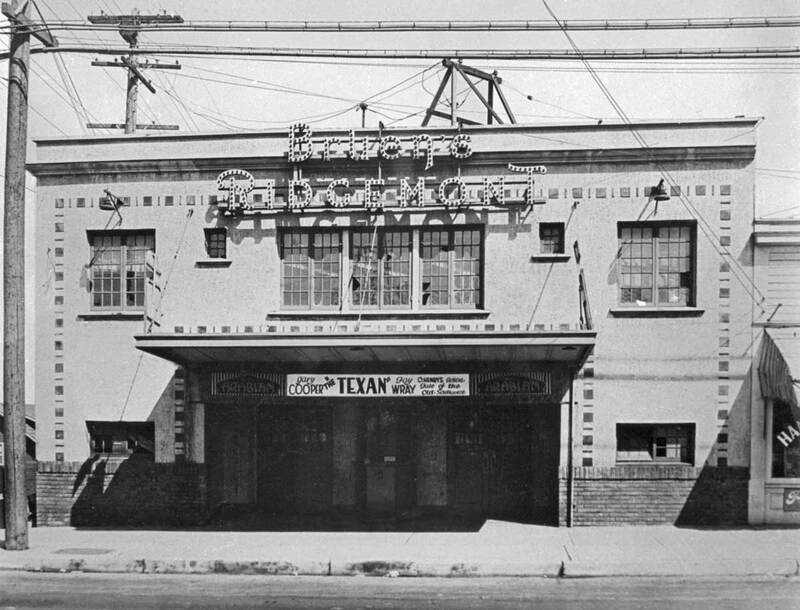 Here is LaVanway’s Ridgemont Theater, and also from ’47. 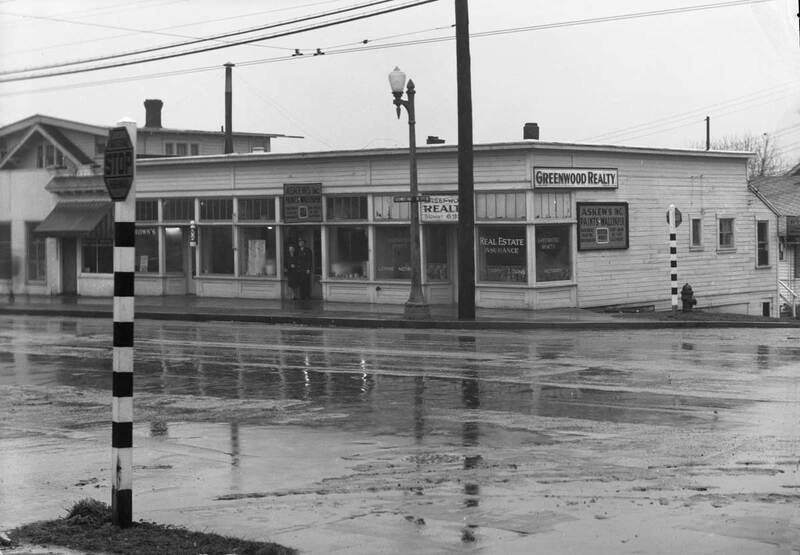 Many of my best early film experiences in big, dark rooms were had from its seats or from Selvidge’s other repertoire venue, the Edgemont in Edmonds. I thank him. 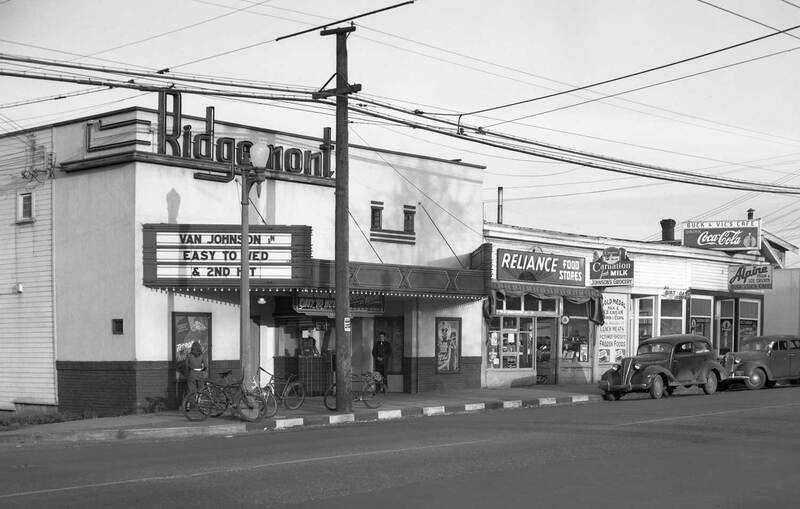 Since most of these were foreign films with subtitles, the Ridgemont was considered by some a “communist front” and the lights of its marquee were at risk — pelted often with rocks, eggs and even excrement. Likely, though, the dangers were small when the Phinney Ridge theater was showing films like those showing here: “Easy to Wed,” a romantic comedy with Van Johnson, Esther Williams and Lucille Ball, and “Terror by Night,” a Sherlock Holmes thriller in which Basil Rathbone has to solve a Rhodesian diamond theft and find a murderer among the passengers of a train running from London to Edinburgh. Easy to do for Sherlock. Rapping it now, thanks to local film historian David Jeffers for this tight summary of the Ridgemont’s long life. 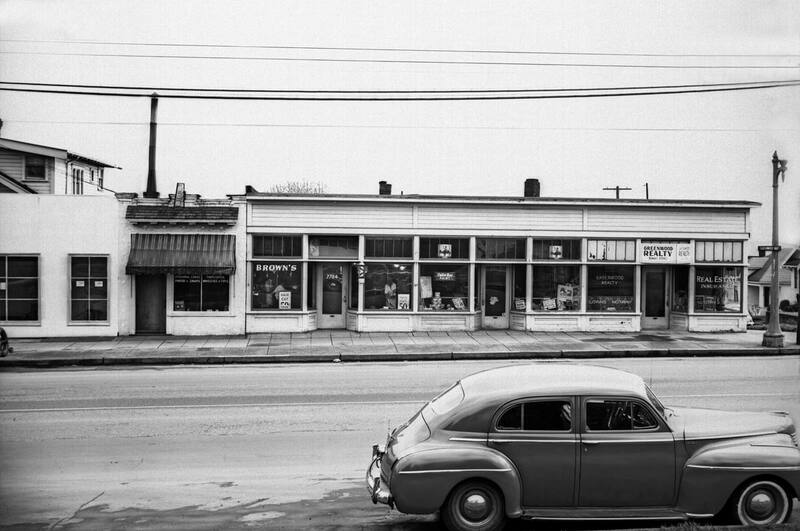 “It was a big-box neighborhood theater with 452 seats. Opened as Houghton’s 78th Theatre in 1919, Ridgemont in 1922, Bruen’s Ridgemont in 1928, remodeled twice, in 1938 and 1967.” After 70 often adventurous years, it closed in 1989. Yes and Welcome back from your European adventures, with your students from Hillside and then also with Berangere (of this blog). The Blog has missed you and your mastering. Now I’ll add a few more photographs, and with little comment. 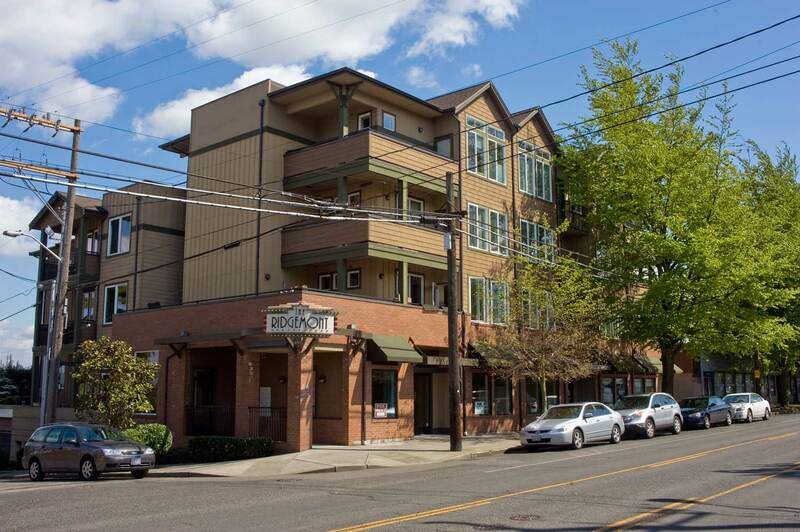 Another of the Ridgemont by LaVanway. And a different double bill is running, including "My Favorite Wife" a screwball comedy with Cary Grant and Irene Dunn that was originally released in 1940 and here apparently brought back following the war. I've seen it and it bears repeating. An earlier look at the Ridgemont as Bruen's Ridgemont with the marquee showing The Texan, which was released in 1930 with Gary Cooper and Fay Wray in her first staring role. This may be later for it is unlikely that a neighborhood theatre would get a first run with these stars. Fay Wray's biggest hit came in 1933 with King Kong, a different kind of co-star - animated. 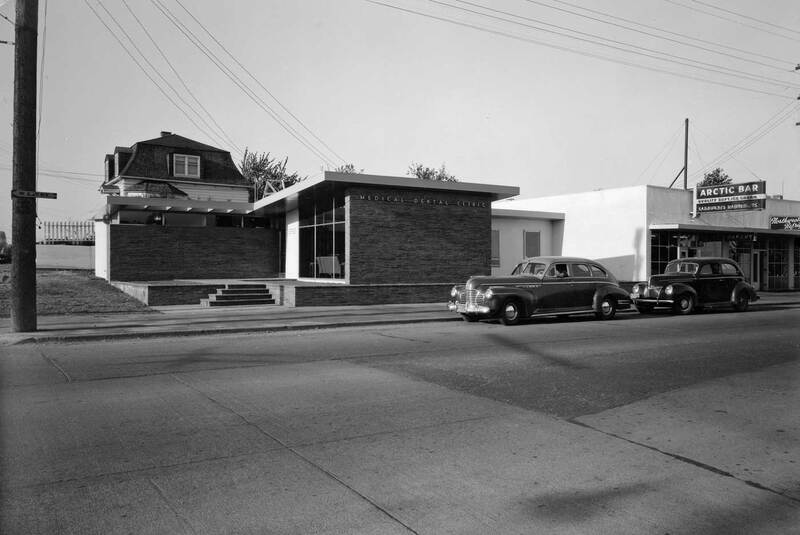 A fine example - again, recorded by LaVanway - of a post-war modern commercial structure, this one at the northeast corner of Mary Avenue and 85th Street and so at the heart of the Crown Hill neighborhood. The building survives, now home to Chadwick and Winters Land Surveying. Previous PostOur Daily Sykes #120 – Flower and FrogNext PostVan De Kamp's at Mercer and Queen Anne Ave. 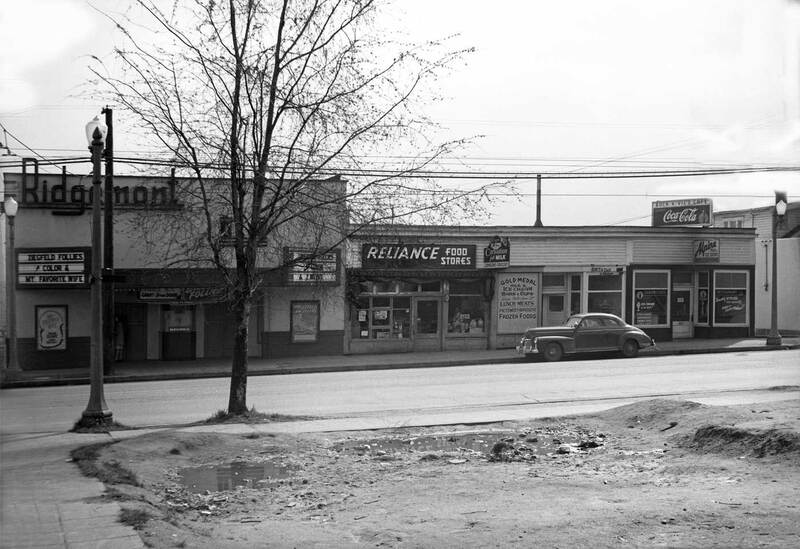 I have so many memories of Magnolia and Queen Anne in the early sixties: KIRO station/towers, QA High School, A&J Market, the bowling alleys in both neighborhoods, the Magnolia Theatre. Are there any photos of them at all ? I can’t seem to find any on the internet. Would love to see them if you have them. We have put several slides of Queen Anne – both top of the hill and lower Q.Anne – but I think they may have been part of the blog that was “stolen” or “squelched” by some programing glitch that may correctable but so far has not been. It involves approximately of the first one-third of the dorpatsherrardlomont opera. Meanwhile I’ll look for a slide or two and put them up in celebration of your memories. I spent two summers with married sisters in Seattle before moving here from the San Francisco Bay Area in 1975. One lived a few blocks from this theater, and bargain matinees at the Ridgemont were a regular activity.